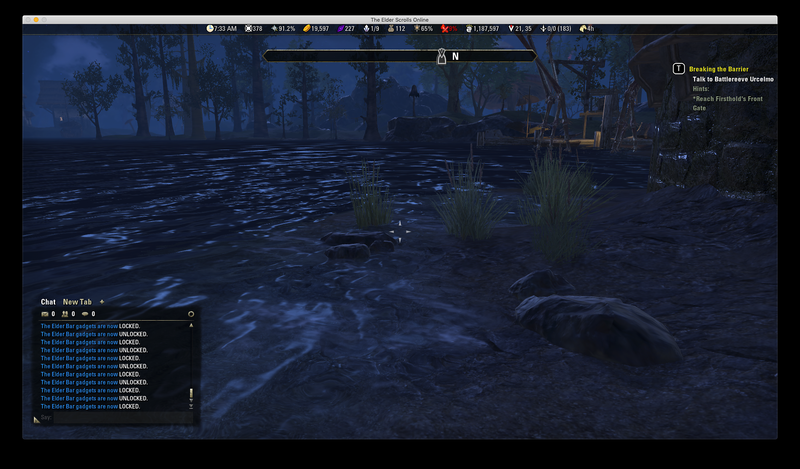 This addon adds an information bar on the screen, chocked full of information gadgets that update in real-time. The gadgets can be placed on the bar in any order and there are lots of options to configure each one. Last, but not least, the bar can also indicate when in combat. The Elder Bar can be unlocked, dragged, and dropped wherever you'd like it. You can assign a hotkey to lock/unlock the bar. Individual gadgets can be unlocked, dragged, and dropped in any order. You can assign a hotkey to lock/unlock the gadgets. There is a separate mode for PvE and PvP -- the bar switches automatically. You can have different gadgets on the PvP bar than you do on the PvE bar. Almost every gadget has options for coloration, warning thresholds, and different options for displaying the data just how you like it. Research and fast travel timers can be automatically hidden when not in use. Every gadget has a tooltip that can display additional information. The Elder Bar can hide itself automatically when you choose. Choices include talking to NPCs, visiting the bank, crafting, and more. The bar can be scaled from 50% to 150% of it's normal size. An optional setting turns the bar red when you are in combat. Track mount training times across multiple characters. You can choose whether to track a character or not. Automatically stops tracking characters with mounts at maximum. Track gold across multiple characters. You can choose whether to track a character or not. Icons come in three variations: classic white, black and white, and color. There are five different pulse settings to draw your attention to gadgets, when a critical threshold has been met: fade in, fade out, fade in/out, slow blink, fast blink. * Cleaned up some internal dependencies. * Fixed an issue preventing the gold tracker from updating, introduced in 9.0.0. * Fixed a crashing issue introduced in 9.0.2. * Fixed an issue with weapon charge/poison gadget when no weapons were equipped. * Fixed the LocalPlayer shenanigans in the Gold and Mount Timer gadgets. * Mount Timer gadget: will now track multiple characters. * Gold gadget: will now track multiple characters. * Experience gadget: added two new options to display actual experience needed instead of a percentage. * Weapon Charge gadget: Track weapon poison when applied to a weapon. * Fixed gender encoding issue for character and location names. * Weapon Charge: fixed issue that prevented the gadget from displaying the weapon charge of the weapon currently being used. * Fixed an issue with research timers displaying "115d" when the "Show Shortest Timer Only" option was selected. * Fixed an issue with research timers so that the word "free" would be displayed if any research slots were open when the "Show Shortest Timer Only" option was selected. * Made open slots more obvious by changing the "--" to the word "free" to indicate free slots. * Fixed an issue with the "slots free" display preference for the Bank gadget. * Fixed an issue that prevented Enlightenment thresholds from being disabled. * Colored icon indicators. Icons will turn red, yellow, or green depending on the state of the gadget, based on the thresholds you've set. * Reworked many tooltips to provide more information. * Mount Timer has new options for drawing the player's attention. The gadget can be automatically hidden if training has been maxed. * Thresholds added to the Enlightenment gadget. Enlightenment gadget can automatically hide itself when there is no enlightenment to spend. * Research timers now have an option to show only the shortest timer. * There are now five different pulse settings to draw your attention: fade in, fade out, fade in/out, slow blink, fast blink. 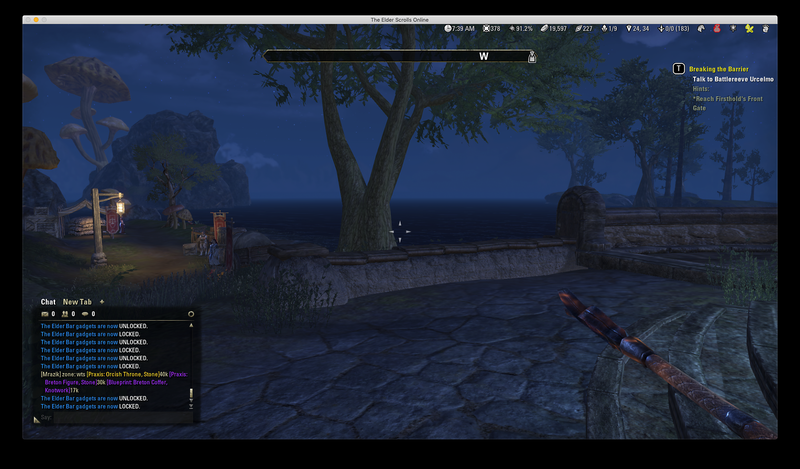 * Removed some redundant settings from Thief's Tools gadget relating to inventory. * Fixed an issue that prevented bag/bank gadget from updating. * Bag Space, Bank Space, Weapon Charge, and Durability gadgets have a new setting that will pulse the gadget when a critical threshold is reached. * New setting to hide the mount training timer automatically when mount is fully trained. * New setting for mount timer to display timer exactly or simply. * Text can be toggled on or off for each gadget. * Icons now come in three varieties: white, color, and grayscale. * Players can now display unspent champion points. * The bar can be scaled from 50% to 150% of its normal size. * Added an additional choice to the bags gadget to display only free slots. * Fixed an issue with durability, which would cause an error message to be displayed until armor was repaired. * Cleaned up things behind the scenes. * Fixed an issue with durability throwing errors when repair costs got over 999 gold. * Fixed an issue with PvP gadgets not being cleaned up in the addon settings file. 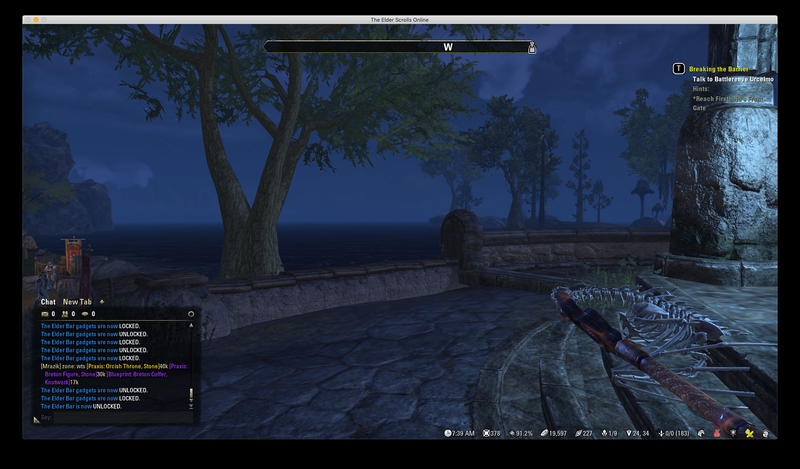 * Fixed an issue where the addon would crash when the ESO durability API calls didn't return a number for cost. * Fixed an issue with the Fast Travel timer tooltip that was causing Lua errors to be displayed. * Fixed an issue that was preventing dragging and dropping of the writ vouchers gadget from working properly. * Fixed an issue with the fast travel timer that causing errors to be displayed on screen. * Players can now define a different set of gadgets for PvE and PvP. 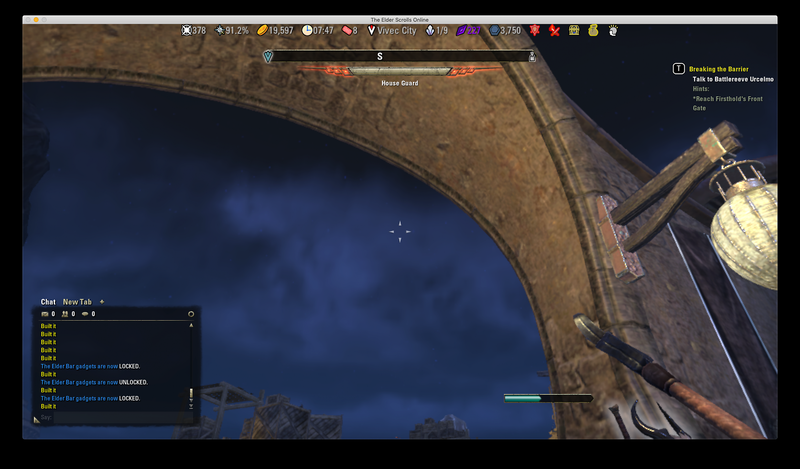 The bar will automatically switch between the sets when entering/leaving battlegrounds/Cyrodiil. * Gadgets now have drag and drop re-ordering. * The bar can now be dragged to any position on the screen. * Added setting for locking and unlocking the The Elder Bar. * Added key binding for locking and unlocking The Elder Bar. * Added setting for locking and unlocking the gadgets. * Added key binding for locking and unlocking the gadgets. * Added new settings to Alliance Points gadget. Players can now choose to display points gained per hour and points gained during session. * Added settings for the fast travel gadget. * Numbers can now be formatted with a thousands separator to make numbers more easily readable. * Settings will no longer be wiped when upgrading to a new version of The Elder Bar. * Fixed bug in all "simple" mode timer to make them more accurate. * Reworked the clock icon so it matches all the others. * Added settings for the location gadget. * Added settings for the thief's tools gadget. * Added settings for the addon memory gadget. * The Durability gadget has additional display preferences to show repair kits in your possession. * The infamy meter will now be bumped upward along with the action bar, health/stamina/magicka bars when the bar is positioned at the bottom of the screen. * Players can now choose to bump up the action bar and magicka, health, and stamina indicators when the bar is positioned at the bottom of the screen. * Combat indicator now has its own opacity setting. * Players can now choose how to display their level when below the maximum level of 50. * Players can now choose how to display their level when at the maximum level of 50. * Players can now choose how to display FPS. * Players can now choose how to display weapon charges remaining. * Players can now choose how to display bag space. * Players can now choose how to display bank space. * Added a new display setting to Sky Shards: "collected/total needed (unspent skill points)"
* Bumped up the API version. 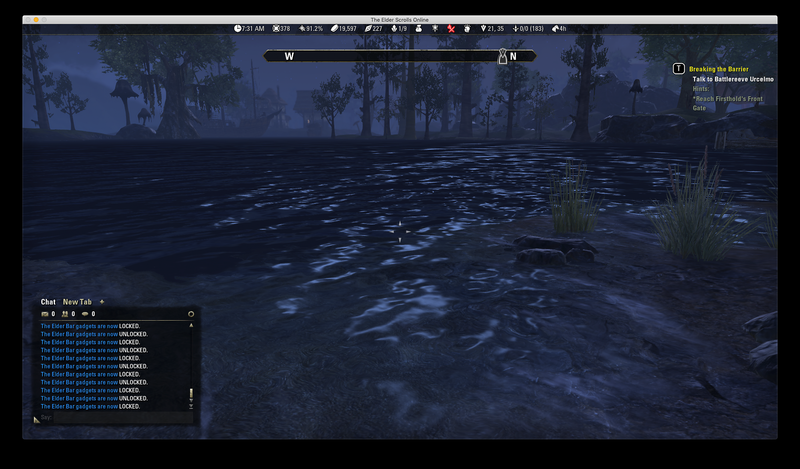 The Elder Bar is ready for Murkmire! * Reduced the number of API calls being made, which could lower latency and increase FPS on some systems. * Changed how the bar is centered when centered to reduce jitter. * Currency tooltips will also now include an icon of each currency to help identify it. * Equipped items are now run through a routine that will attempt to correct improper capitalization and trailing control characters when viewing durability and weapon charge tooltips. * The combat indicator will appear at the same location as the bar, instead of always at the top of the screen. * The combat indicator will now disappear when out of combat at the expense of a yet another cyclical API call. The indicator will also now honor the bar opacity as intended. * Players can now choose in what order gadgets display. * Players can choose how to display item durability. * Players can choose how to display the research timers. * Players can choose how to display gold. * The bar can now indicate when the player is in combat. * Tooltips have been reworked so that they are more useful. * "Telvar Stones" spelling has been corrected to "Tel Var Stones". * Fixed vertical alignment of gadgets. * Removed the completely useless Character Name gadget. Character name has been implemented into the Level/Champion Points gadget tooltip. * Fixes telvar stones/writ vouchers/transmutation crystal icons still being displayed even when turned off. * The Elder Bar should no longer produce errors on German or French clients. * Updated how soul gems are detected. * Players can now choose how to display the soul gems in their possession. * Players can now choose how to display the sky shards they have collected. * Currencies were split up into individual gadgets and they can each be turned on and off. * Fixed layering issue. The bar should now be underneath all other addons, crafting panels, etc. * Clock - Displays current local time. * Players can now choose to display the Current Time in 12 or 24 hour format. * Players can now toggle pieces of information on and off. * Icons are now slightly larger (and hopefully easier to see). * Changed "bump compass" option to on/off switch. * Added MIT license to addon directory. * Clarified "bump compass" setting text. Hey. I really like your addon. Great job. Could you add the option to disable this messages in chat? The Elder Bar is now LOCKED. I use this addon and receive the below error when in dungeons or using ultimate. Control [ZO_PlayerAttributeHealth] already has two anchors, adding another will have no effect. I believe the issue is The Elder Bar addon. It is caused when you have two addons loaded and both are set to move the health bar. This isn't necessarily an Elder Bar issue. However, if you don't want Elder Bar to ALSO move the health bars, turn the option off in the settings. Turn off "Bump the action bar up when bar is at bottom". I noticed this myself the other day, but I have been too busy with work to look into it. I believe I somehow have two different calls to the "save the gold" function: one with the corrected name and one without it. I just need to go through the code and find it. It worked fine earlier but this started to happen some weeks ago, I'm not sure exactly when but I noticed after when quite a few addons got broken after an update. Another thing, my Minion seems to think I don't have TEB installed from time to time so I need to check manually if there's updates. No other addon for me has done this and I can't figure out why it's happening. It's not a big deal but I'm curious if someone else is having the same problem. Last edited by daimon : 03/26/19 at 10:28 AM. First off thank you very much for creating this addon as I love it! On characters that I have completely researched everything, is there a way to show that the character doesn't need to research that craft anymore or a way to set it to remove the icon? I know the "Only show timers while researching" option works but then does it for every character. I am not sure if that makes sense but even if you could just add it so the Research Timers options could be per character like the Mount Timer that would solve my request. Howdy. Yep, I'll take a look into adding that! I hadn't even thought about it as I haven't researched Nirnhoned for every slot yet. Great, thanks! I have several max level crafters and few on their way so if you want me to test something just let me know. Cleaned up some internal dependencies. I had to deinstall too until it's fixed. Thanks for keeping up the good work! ps. is there any known reason why Elder Bar vanishes from my Minion list from time to time ? Sometimes I miss the updates as it has gone from my lists (even installed) and I don't notice to update it until I check it specifically. I have the same problem, tried to uninstall/reinstall TEB several times (with or without deleting saved variables), but Minion detects it installed exactly once every two launches. I tried renaming TEB folder (in case Minion had trouble with addon name), and reducing TEB.txt size (in case Minion had trouble if it was too huge), with no success. Last edited by Dr4Wm4N : 02/17/19 at 03:59 AM.